By none will be outdone. Gives her a good tight lacing. This satire, dated 1777, is pointing out the folly of not only tight lacing but also dressing above one' s station in life. The setting is a humble workroom, filled with the cobbler's tools of his trade. 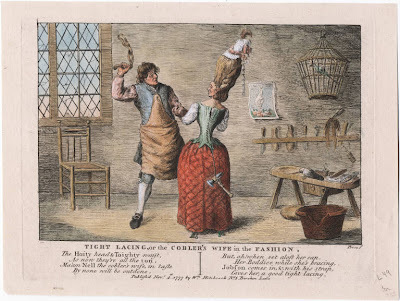 His fashion frenzied wife is dressed in stylish stays, a silk quilted petticoat and an extremely high hair style topped with a frilly beribboned cap. Unlike the "Tight Lacing or Fashion Before Ease" print, the cobbler's wife does not have a footman or lady's maid to assist in lacing her stays and so employs one of her husbands tools as a weight to the stay laces to draw them tightly. The husband enters the scene with his strap in hand and will beat good sense into her. Thanks for posting this I highly appreciate it.